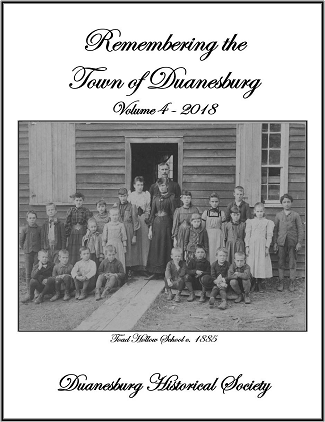 Arcadia Publishing Co. published Images of Duanesburg and Princetown for the Duanesburg Historical Society. This book of 128 pages contains 220 vintage pictures of Town of Duanesburg, Quaker Street Hamlet, Village of Delanson, Mariaville, Creekside, and Town of Princetown. This 89 page book was produced by Clarence Foote, a former Town of Duanesburg Historian. Arthur Willis, our present Town Historian states, "This book is an anecdotal social history of our town that opens numerous windows into the lives of our posterity." This book has now been republished by the Duanesburg Historical Society to renew our connections to the past. 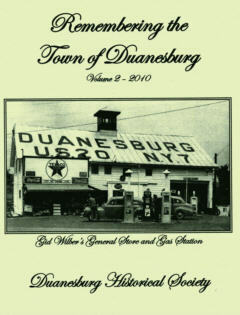 This publication of the Duanesburg Historical Society is an ongoing project. This is a collection of writings of those who have spent most of their lives within the town of Duanesburg and surrounding areas that have written wonderful stories of what life was like growing up here in the western most part of Schenectady County. The Duanesburg Historical Society in is continuing endeavor to preserve the oral and written history of our town has gathered another season's worth of memories stories and historical research. Volume 2 contains 157 pages 36 authors and over 75 stories. Volume 3 contains 158 pages by 46 authors and 58 stories. The telling of personal stories and the delving into the history of our community is an ongoing journey to understand those early settlers to the Town of Duanesburg and to appreciate the fabric of our community. We are all a part of that history and these authors have taken on the responsibility of gathering our history and setting it down in a meaningful format for future generations. The remembering, the researching, and the writing are personally satisfying. The reading is intriguing and thought provoking. Please contact us via the Book Order page to purchase these books.